So as to cater to the varied requirements of our customers we are engaged in offering our customers with Wind Driven Industrial Ventilator. This is made using only quality certified material at our production unit. 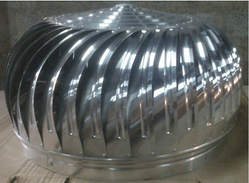 In order to meet various demands of our esteemed clients, we are engaged in manufacturing an optimum quality array of Wind Turbine Ventilator. The sought after solution for small warehouses, godowns etc. Max Exhaust Capacity: 2700 C.F.M.